The 18th-century philosophy article deals with the period often called "The Enlightenment" and its antagonist, Counter-Enlightenment. 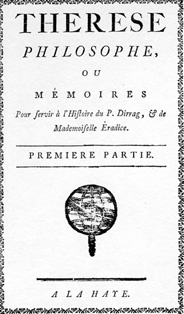 "The Enlightenment" centered on the rise of systematic empiricism, following after Sir Isaac Newton's natural philosophy. Thus Diderot, Voltaire, Rousseau, Montesquieu, Kant and the political philosophies embodied by and influencing the American Revolution are part of The Enlightenment. Other prominent philosophers of this time period were David Hume and Adam Smith, who, along with Francis Hutcheson, were also the primary philosophers of the Scottish Enlightenment. "Counter-Enlightenment" is a term used in the second half of the twentieth century to refer to a movement that arose in the late-eighteenth and early-nineteenth centuries in opposition to the eighteenth century philosophy of Enlightenment. It sometimes operates as "a kind of shorthand for any opposition to the dominance of Enlightenment thought. "The term is usually associated with Isaiah Berlin, who is often (mistakenly) credited with coining it. The German philosopher Friedrich Nietzsche used the term Gegenaufklärung at the end of the nineteenth century, although only in passing. It has not been widely used since. Isaiah Berlin published widely about the Enlightenment's enemies and did much to popularise the concept of a Counter-Enlightenment movement that he associated most closely with German Romanticism; however, recent scholarship has challenged this view for focusing too narrowly on Germany and stopping abruptly in the early nineteenth century, thereby ignoring the Enlightenment's many subsequent critics, particularly in the twentieth century. Some scholars reject the use of the term 'the Counter-Enlightenment' entirely, on the grounds that there was no single Enlightenment for its alleged enemies to oppose. 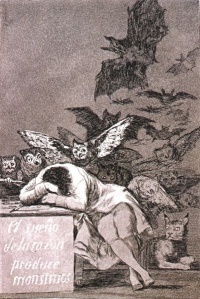 In the visual arts it is represented by Francisco de Goya's "The Sleep of Reason Produces Monsters"
Unless indicated otherwise, the text in this article is either based on Wikipedia article "18th-century philosophy" or another language Wikipedia page thereof used under the terms of the GNU Free Documentation License; or on original research by Jahsonic and friends. See Art and Popular Culture's copyright notice. This page was last modified 08:49, 7 February 2014.